Hae Yeon Choo is an Associate Professor of Sociology at the University of Toronto and is a 2018-2019 Deutsche Bank Member of Institute for Advanced Study (Princeton, NJ). She is the author of Decentering Citizenship: Gender, Labor, and Migrant Rights in South Korea (Stanford University Press, 2016), a comparative study of three groups of Filipina women in South Korea: factory workers, wives of South Korean men, and hostesses at American military camp town clubs. 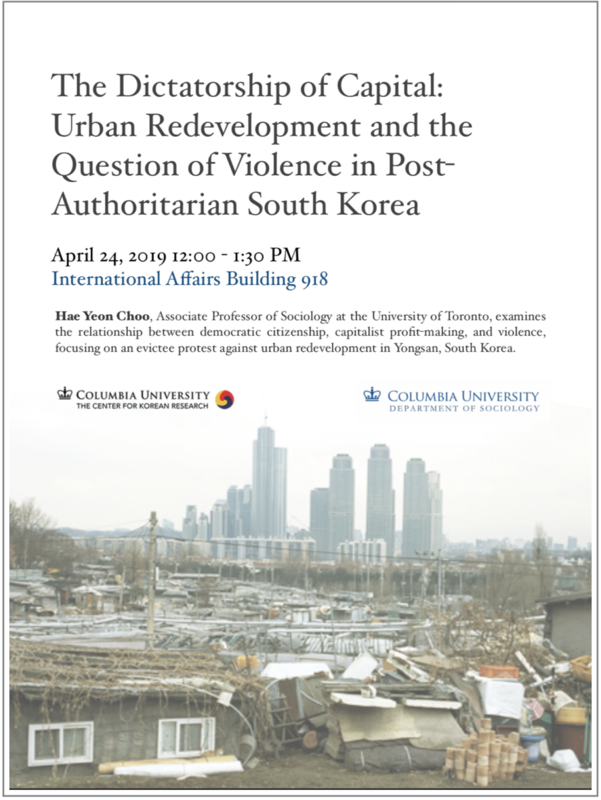 Her current research project examines the politics of land ownership in contemporary South Korea, delving into macro-level political contestations over land rights, together with the narratives of people who pursue class mobility through real estate speculation. She has also translated Audre Lorde’s Sister Outsider and Patricia Hill Collins’s Black Feminist Thought into Korean.